Today was a great day because the gorgeous Becki from the super fun blog, The Struggles of a MUA nominated me for a Sunshine Award! Check out her award post HERE. 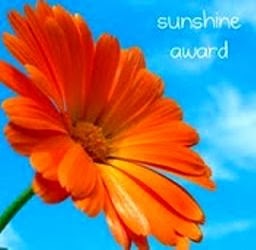 The Sunshine award is given to bloggers who are positive, inspiring, creative or who’s blog you really enjoy reading. Since some days my pageviews are embarassingly low, this feels incredible...like I'm not just talking to myself out there in the blogosphere! 1. I have two younger sisters age 30, and 18. 2. So yes, that makes me in my thirties! 3. Being in my thirties makes me slightly self-conscious about being on the older side of beauty blogging. 5. I live just outside of Boston. 6. I have an insane phobia of birds. 7. I may be the only person on earth that doesn't like fall. Sure it's pretty but it just means that winter is coming and I hate cold. 8. I was a gymnast from age 5-17. Sadly, I can barely do a cartwheel now. 9. I love shows like Walking Dead, but also The Bachelor. 10. I bought my condo 2 years ago and it was one of my proudest moments! 11. I'm shy in my blog. It's hard for me to post close up makeup pics and if you've noticed, my main pic isn't even close up. 1. What inspired you to start blogging? My obsession with beauty products! I just love talking makeup and hair and skin stuff. I’m always giving friends and family tips on the best and newest products so I figured I’d write it all down and share with whoever else stumbles upon my blog. 2. Who is your idol and why? Anyone who writes for a beauty magazine. That's my dream job. 3. At what age did you start loving make-up? Must have been 5th or 6th grade. I got obsessed with my friend’s makeup but I wasn’t allowed to wear any yet. 4. What is your favorite film? My Cousin Vinny. 5. What is your favorite brand of makeup? I’m not really attached to one brand. I usually do stick with Urban Decay for eyes though. 6. If you could recommend me one concealer what would it be and why? I really like wearing MAC Prep + Prime as a concealer. 7. Who is your biggest crush? I’m guessing this means celebrity crush. Channing Tatum. Duh. 8. Where would you like to see yourself in 5 years time? I would love to be a well known beauty blogger at that point. 9. Where to you find the best clothes? The clearance section of Banana Republic, J. Crew, and Gap. Also Express for going out clothes and Forever 21 for trendy pieces. 10. Who was your first celebrity crush growing up? Zack Morris! 11. What was your first concert? Garth Brooks. I was 19. 3. At what point did you know that your blog was “taking off” or if you are new like me, what would make you believe that you are "taking off"? 4. What is your fave hair product? 5. Do you use anti-aging products yet? If so, what is your must have? 6. What is your fave tv show? 7. What is your favorite time of the day to catch up on the blogs you follow? 8. What do you do when you’re not blogging? 9. Do you have any piercings or tattoos? 10. What is your fave type of music? 11. What is your fave comfort food? I will let these lovely ladies know they’ve been nominated. This was something fun to do. It may actually help me finally write up an About Me page! Awww, thanks so much! I love your blog, I check it everyday! 2. I'm a new again blogger. I've started a few blogs before but because of my schedule, I took them down =( However, now that I do have some time, I've been blogging about beauty since July this year! 5. Does an eye cream count? Hehe. I'm close to being 26 and so I'm starting to do more research on how to incorporate anti-aging products into my skincare routine. Thanks so much! You are gorgeous! Can't wait to read your Sunshine award post so def. let me know when it's up! Those are some very kind and wise words. so glad we are becoming blogging buddies! I'm just starting out but communicating with like-minded ladies may be my favorite part of blogging!